General economics covers articles and posts that elaborate upon the basics of economics that are covered in this blog under http://www.economicsjunkie.com/praxeology/ and all sub pages. Once again good news on the housing market for the middle class and less fortunate people: Home prices continued to drop across the board, thus making homes more affordable to the average American. The composite index dropped by 19% when compared to September 2007. The two cities with the largest annual declines were Phoenix (32%) and San Francisco (30%). Nationwide home prices are still at 2004 levels so there is still plenty of room for falling prices in the months to come. Full Report: Go to S&P Website. Barack Obama, President Bush and Wall Street don’t like to see homes become more affordable to the little guy who works hard, produces, and saves up money. They hate to see opportunities for common people to realize their dreams of owning a home one day. They have pledged to do whatever they can to stop home prices from dropping further. They want to take money away from those people via taxation and inflation in order to prop up home prices. I have a recommendation for them: Why don’t you start a program that aims at burning down 1/3 of the entire supply of homes in the United States. This will successfully stop home prices from falling sooner or later. If 1/3 doesn’t suffice, just keep firing up additional homes until the supply is low and prices high enough so only the very fortunate people will be able to buy. This, and nothing but this, is the essence of what they are trying to accomplish, intended or not. It is amazing that the market is still able to listen to the consumers’ value preferences and let prices develop accordingly in the face of unprecedented government intervention. 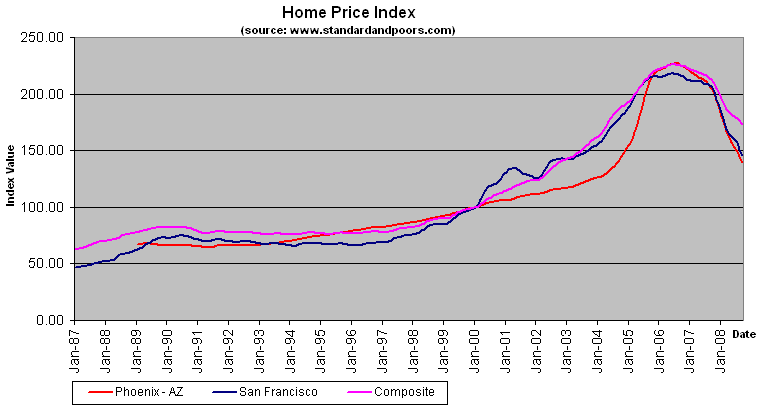 Home Prices – May 2009 – Beginning to Bottom Out? The government has introduced a pair of new programs that will provide $800 billion to help unfreeze the market for consumer debt which Treasury Secretary Henry Paulson calls vital to supporting the economy. Paulson says key markets for consumer debt such as credit cards, auto loans and student loans essentially came to a halt in October. He says the new programs are aimed to get lending back to more normal levels. Paulson says all the government programs have been aimed at supporting the lending that is vital to the economy. What? $800 billion? Where does it come from? When did Congress approve this? Is this a joke? 2 months ago they were fighting bitterly over $700 billion and now we have gotten to the point where $800 billion are mentioned in a side note. They have completely lost their minds. Just a few days ago I mentioned that consumer credit is going to collapse in 2009. Nice little Christmas present before they jump ship. Expect the money supply and gold to soar. Herewith a few thoughts about the economy, public policy and retirement. First, a note to the mighty international powers convening at the White House for the G-20 Summit to consider the world economic and finance slowdown. In this situation where aggregate demand is collapsing and where credit is desperately tight almost everywhere, the future dangers facing us are all on the deflationary side. OK, first of all, Mr. Stein, deflation is a drop of the money supply. At best you could hold that a deflation is a very slow growth or a stagnation of the money supply. Deflation, in that sense, actually started in the middle of the year 2006, indicating an upcoming correction of home, asset and consumer prices, usually starting within 1-2 years from then. This is what many libertarians, including myself, predicted at that point in time. 1 year later the US housing bubble began to leak its first holes. October 2007 kicked off the bear market on Wall Street. 6 months later the commodities and foreign exchange bubble began to deflate. Until October of this year we have seen a significant slowdown of the true money supply. Did you ever, during that time, happen to have the foresight or at least a grasp of what was going on at the time to talk about deflation? Now you are warning of a deflation? Now that the money supply has once again began to grow at an annual rate of 8%, after numerous government bailouts, loans to failing businesses, banks, car companies, Term Auction Facilities by the FED, stimulus packages, you are warning of a deflation? I’m sorry but you pretty much missed out on this one. Secondly, your statement seems to imply that a deflation is a “danger”. I hope you are aware that this deflation was nothing but a correction from a previous credit expansion which went on from 1992 through 2000 and was recklessly propped up from 2002 through 2006. Deflation is exactly what is needed in order to realign the factors of production to useful occupations. Otherwise we will be back where we are today in only a few years. I suggest you read up on credit expansion. Do you really think we need more realtors, investment bankers, failing auto companies, banks, hedge funds, and reckless lending? OK, then I recommend you have a look at the money supply data as of October 2008. We’re back to were we were in 2002, it’s the same old song. We are repeating the same mistakes. And you are cheering it on. Also, you are saying “this means” as if there was any connection between the previous paragraph and what you are writing in this paragraph. What is the connection? Because we are in a deflation we need to start another inflation so in 7 years we will be in another, much more serious, deflation? Your reasoning makes no sense whatsoever. …and have been doing for the past 7 years. Are seriously you suggesting that we do more of it? Is this your solution to the crisis? Does it not cross your mind that maybe this policy is what has gotten us into this mess? …ok which one is it now? Tax hikes or cuts? Do you have any concept at all? …of course paid for through inflation and credit expansion which is exactly what caused this mess. Believe it or not, but doing the things that caused our demise will not help, but aggravate the crisis. …Bailing out the big auto companies, offering loan guarantees to encourage banks to lend, making sure lending facilities are in place for credit card issuers – all of these should be done and immediately. No, we should not bail out businesses that are worth less than MINUS (!!) $56 billion, that produce goods that no one wants and that employ resources that would be much more useful elsewhere. The more we spend on them, the more agony we cause for the common people as I have explained in The Economics of Corporate Bailouts. Your plan above is a disastrous step by step guide on how to put the final nails in the coffin of the US economy. Obviously, this is also a time for extreme monetary growth. As we economists would say, the velocity of money — that is, how often it changes hands — is falling rapidly. This means the Federal Reserve can pump up the quantity of money greatly to offset that fall without fear of inflation. There are the usual “pushing on a string” limits to how well this will work but it must be attempted. What do you mean by obviously? What are you basing your recommendations on? You are making one claim after another without any backup. What help is it if the central bank pumps up the money supply? Absolutely nothing is produced when newly printed money is injected. To the contrary, misallocations result in even less useful production. And again, please note that as outlined above, what you are asking for is exactly what we did in the 90s and 2000s. Why should we do it again? We need the opposite. We do need less consumption, more savings, and a proper allocation of resources to occupations where they are needed. The real issue choking the economy now is lack of lending and fear by the banks and other lenders. This must be met by explicit solvency guarantees from the central banks. There should be no pussyfooting around this. It’s a matter of extreme urgency. The real issue that is choking the economy has been excessive lending via credit expansion. What do you mean by “solvency guarantees”? You mean that businesses that borrowed and spent recklessly should get more money to keep doing what they have been doing, money, of course, that will be taken from the taxpayer, the common man, who is suffering enough as is? Whether you finance it via taxation or inflation, the common man will foot the bill for any bailout. What do you mean by pussyfooting? You mean like actually using your head and trying to fix the problems we have created? The sums involved will be substantial, but tiny compared with the losses to the world if we slide into a world wide depression. I offer as an example that it might have cost the government about $30 billion to $60 billion to save Lehman. That was deemed too expensive. The losses to the U.S. from the panic caused by that blunder are on the order of $4 trillion to $ 5 trillion. This is what is at stake if we do not spend the hundreds of billions and maybe a trillion or more to reflate the economy now. If Lehman generates losses in the billions of dollars then the damage is already happening . They withdraw resources from uses where they are of more use and employ them in occupations of less use. If we take money from the common man, asking him to restrict his consumption, and throw it at Lehman then they will keep pursuing the same failed business strategy. How is this helping anyone? What damage has been done to the economy by letting Lehman go bust? What are you basing your numbers on? The trillions of fictitious paper value wiped out? You mean like those trillions that got wiped just as much after billions, if not trillions, of Term Auction Facilities, Deficits, and Bailouts? You are so utterly wrong I can’t even express my discontent with what you are writing. You mention a depression. Have you any idea of what caused the crash of 1929, and what turned it into a depression. Have you read any credible books about this event? As always I recommend “America’s Great Depression” by Murray Rothbard. Mr. Obama clearly has a better idea about this than Mr. Bush, who is dragging his feet about Detroit and other aspects of reflation. I hate to say it, but I think we are lucky Mr. Obama won the election. Of course, time will tell. What do you mean by Bush dragging his feet about Detroit? Are you referring to the billions that have already been made available to GM, the countless subsidies, “bridge loans”, and what have you, all for a company that has a Shareholder’s Equity of less than MINUS $56 billion? I desperately hope I am wrong and I may well be, but the government has to put in a bottom here. Otherwise, the bottom is very hard to see. Again, I hope very much I am being too pessimistic. In that sense, I have good news for you. You are dead wrong. In fact, there is hardly one single thing that you are right about in this article. The fact alone that you write an article and in it say that you hope you are wrong shows me that you have no basic concept of the workings behind the business cycle, credit expansion, inflation, deflation, monetary policy, and bailouts. Secondly, the broad stock market is now at levels it hit roughly ten years ago on the Dow Jones Industrials Average and the S&P 500. This means something horrifying. If there are to be no long term gains in stocks, the retirement projections of almost everyone are simply demolished. Unless a pre-retiree is terribly lucky, he or she cannot count on meaningful gains in stocks. Obviously, the interest on bonds is modest and aside from Treasuries, they have been hit hard as well. If workers can only rely on dividend and interest income and not on long-term capital gains of 8% or 9% per annum, pre-retirees have to save enormously more than they had anticipated to adequately fund their retirement. This is serious business. Yes, bond interest is dropping because the government is once again inflating the market. It is true, one should be concerned about the future productive capacity of this country. It is an important component towards a safe and prosperous retirement. But you are destroying your country’s productive capacity if you keep going down the spiral of inflation, credit expansion, and corporate bailouts. The objective of economic policy is to optimize the utilization of all factors of production as per the market participant’s value preferences (demand), and not to continuously employ them in operations that generate losses and that the consumers don’t need. Again, I hope I am wrong. Historically, stocks have major recoveries after falling as low as they have in recent months compared with the 15-year moving average of stock prices. This is what my pal Phil DeMuth, of Conservative Wealth Management, tells me, and he is a super smart fellow. But I would also consult my pal Ray Lucia, who requires his clients to have a very large amount of cash or short-term Treasuries to get through long difficult stretches. Ray’s advice has turned out to be spectacularly sensible. But, again, if we have a lot of low return cash and low return stocks and low return bonds, we have to save much more than we thought we did three or even two years ago. Yes, I have nothing to add in addition to what I already said in my previous comment. This makes reflation even more desperately needed. I hope Mr. Bush will wake up, stop listening to Dr. Evil, his Treasury Secretary, Henry Paulson, and work with President-Elect Obama to get a large, serious stimulation package into the economic bloodstream pronto. The fact that you repeat wrong statements doesn’t make them right. You have not understanding of what has happened, what went wrong, and naturally have no solution to this disaster at all. You are mixing up buzzwords, such as “stimulus”, “reflation”, “inflation”, and “deflation” without any basis. Your ‘solutions’ won’t work. Yes it is. It is because you and many other fellow contributors are completely puzzled by what is going on, and yet infecting the public with utter falsehoods. Public opinion ultimately shapes policy. The public needs to be educated about what really happened and what really needs to happen. You have no historical understanding of what caused the mess we’re in. You are recommending more of the same policies that got us here. I am asking you to take your responsibility toward the public serious. Many are reading and listening to what you write. As we continue driving this economy into a ditch, please don’t forget that you bear part responsibility for it if you keep writing what you’re writing. Author NimaPosted on November 24, 2008 December 18, 2008 Categories General EconomicsTags corporate bailout, reflate economy, stimulus3 Comments on Reflate the Economy? Now?? When analyzing an economic system, it is first and foremost relevant to analyze the actual actions of the actors who fulfill economic functions in that system and the actions that the government takes. All labels that are attached to groups or individuals need to be stripped off and cast aside. It is in particular imperative not to rely on what government officials are saying, but to take a close look at what they are actually doing. It is important to understand the context and the scope of the science of economics. It is a common misconception that economics is a science that primarily deals with maths, numbers, statistics, averages, medians, and charts. Myriad university professors all across the globe teach students about supply and demand curves and how to calculate market equilibrium through the derivative of those, and perform many other numbers games. All this accomplishes nothing but to obfuscate the true essence of economics. Little attention is paid to important concepts, such value and time preference, the formation of prices, the importance of consumption goods vs. factors of production, the concepts of money and monetary policy. All market data is nothing but the outcome of actions performed by individuals, cooperating, producing, consuming, and competing on the market. Economics is first and foremost a science of human action, so before embarking upon an analysis of statistical data and mathematical concepts it is indispensable to understand the motivating forces behind actions performed by humans. Those have been fully explained by Praxeology.